Were Abraham and Jared contemporaries? This may seem a strange question to most members of the church. The majority seem to think that Abraham came much later in time. But whether they were aquainted or not, they did live during the same chaotic environment and experience many of the same trials which were present during this epic period in the earth's history. In the Book of Jasher we read that Abraham was raised in the home of Noah and Shem. As a result he was taught the gospel as a child. His father and family were not so fortunate. They had been thoroughly indoctrinated in the practices of paganism. When Abraham was 50 he returned to the home of his father Terah in Babel. At the time, Terah was captain of the king Nimrod's army. Abraham was apalled by his father's idolatry and destroyed his pantheon of idols. Terah brought his son before king Nimrod for judgement and Abraham was sentenced to die. He then was miraculously saved by the Lord. Abraham decided to leave Babel and traveled to Haran in northern Mesopotamia. He took his nephew Lot, as well as his father Terah, who had repented of his desire to kill Abraham and was apparently in disfavor with the king. When Abraham was 55 he was commanded by the Lord to go to the land of Canaan. The Lord promised him this land for an eternal inheritance. When he was 58 (2006 BC) and had been in Canaan for 3 years, the patriarch Noah died. Abraham later died when he is 175 years old (1889 BC). Do these events in the life of Abraham overlap those of the Jaredite history? That depends on the dating of the Tower of Babel and the Confusion of Tongues. These are a little more difficult to date. From my research it seems that they probably occurred between 350 and 400 years after the flood (or 2006 to 1956 BC). If this is true, then Abraham lived during this tumultuos epoch. But if he did witness these events, why doesn't he mention them in his history in the Book of Abaham? One possible explanation is that he wasn't actually at Babel when they occurred. He may have been in Haran or Canaan which were both some distance from the site of Babel. It must be remembered that the mideast was fairly well populated at that time with many other cities and nations. The events at Babel would have been fairly localized, at least initially. At first, others at a distance may not have even been aware of what had occurred. The account of Jared gives the impression that the confusion of tongues may have been a gradual process. They knew it was happening, or was going to happen, yet they had suficient time to petition the Lord to spare them from the consequences. There is one reference from Abraham that might refer to the events at Babel. He mentions Potiphar's Hill. Is it possible that this was the name for the tower. 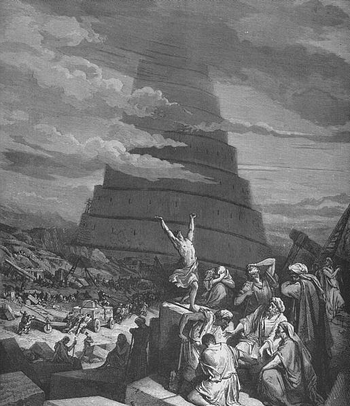 (Actually, “tower” is a very poor name for the monument at Babel. All authorities agree that it was not a tower, but a ziggurat, or artificial hill or mountain.) This seems to be an Egyptian name. The people of Babel may have even borrowed the idea from Egypt, which was a kingdom in its own right at the time. In fact Nimrod's entire paganistic culture may have been imported from Egypt. Abraham mentions that the priest and some of the gods were of Egyptian origin. On the other hand, the Jaredites were apparently eye witnesses of both the tower and the confusion. Later Indian legends tell us that the leader (who I assume was Moriancumer) was present at the construction of the tower and witnessed these events. We read that he asked the Lord to spare his family and friends from the confusion of tongues. They were directed to undertake a herculean odyssey to a new land. Abraham's group may have been one of these. We often picture him as a lone shepherd on the hills of Canaan. But he was far from alone. When he left Babel, he had 300 men following him (Jasher 12:41). When he left Haran he took with him “the souls that [he] had won in Haran.” Later, when Lot is captured in the battle at Sodom, Abraham “armed his trained servants born in his own house, three hundred and eighteen, and pursued them unto Dan.” gen 14:14. There they destroy the armies of the five kings and rescue Lot and the other captives. On his way back, Abraham meets Melquisedek (or Shem-see D&C 138:41) and pays tithes of his bounty to him as the presiding patriarch of the Lord's kingdom on the earth. Does all this make any difference? I believe it does. By understanding the relationship between the different scriptural accounts we can better understand them. The Book of Abraham enriches the Book of Ether and visa versa. We can better see the hand of the Lord in all the events of their time, and relate it to His involvement in the events of our day. We each live in an epic age, are commanded of the Lord to go forth and find our own promised land, and build our own kingdoms. We are promised wonderful blessings if we continue faithful to the end. What histories will they write of us?